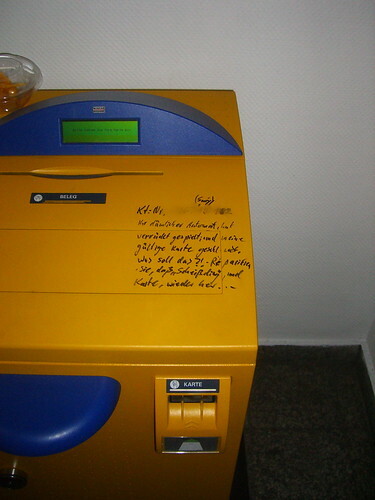 Your stupid machine went nuts, and swallowed my valid card, what’s up with that?! Repair the “goddamn thing” and gimme my card back! But please, can somebody help me to understand this message in heavy dialect? At least nuclear-power I don’t like either. The other small demographic problem? How do you wanna solve that? 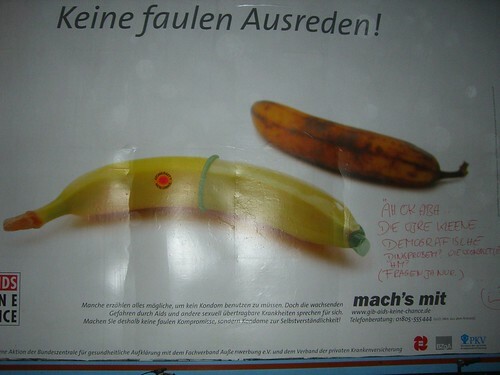 “Keine faulen Ausreden” means “no lazy excuses”, but “faul” means also rotten, like the banana in the background… No lazy excuses for not using a condom of course.